Everyone loves a good underdog. And everyone can find motivation in the "us against the world" anecdotal cliché. Whether it's a scrappy squad filled with no-namers that takes down the #1 team in the land – or it's that passing grade you got in the math class no one thought you should have taken in the first place – the story of the underdog captures our collective national attention. And, truth-be-told, nothing epitomizes the original underdog story quite like the group of rag-tag farmers that stood toe-to-toe with the greatest military force ever assembled in world history. 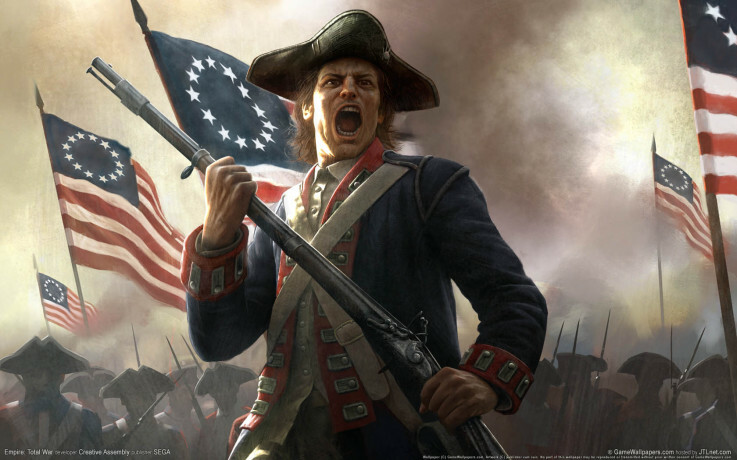 The American Revolution was a conflict between the 13 British colonies in North America and their mother country, Great Britain. 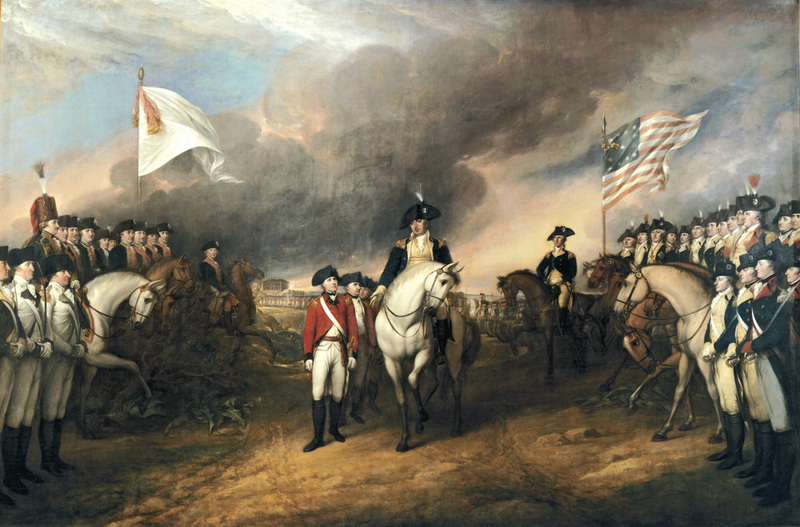 It was made up of two key events: the American War of Independence (1775-1783) and the penning of the Constitution in 1787 that made the new nation a republic in which power resided with the people. 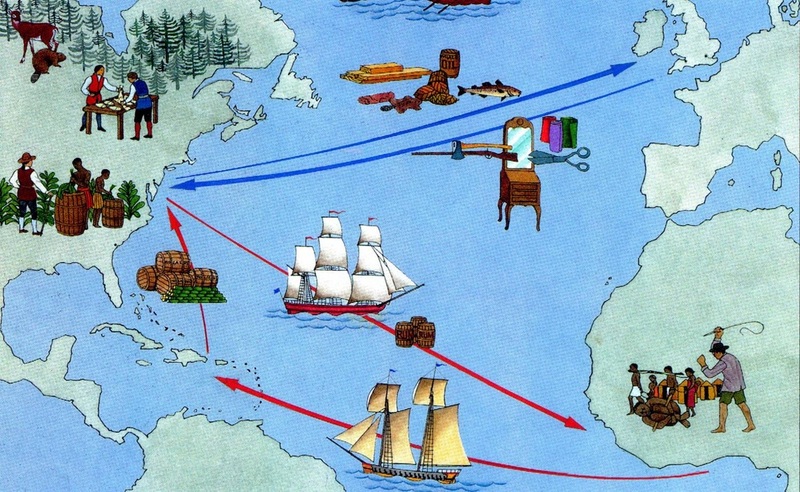 To implement mercantilism, England passed legislation called the Navigation Acts that made their colonies trade only with the mother country. The acts also required that stuff imported or exported by English colonies in Africa, Asia, or America had to be shipped on English boats. (It's called "job security" for English shipbuilders...) Coming off of decades of salutary neglect (and missed birthdays), the American colonists were a little peeved at this move. For the umpteenth time, Britain and France would wage war. Despite neglecting its American empire for some time, England was shocked to find its colonists trading (and cavorting) with... Frenchies! While Britain is away, the French will play. Is it England... or Britain? Wait... you just called England "Britain". Which is it? Dr. Hartnell is glad you asked... the Act of Union in 1707 took the countries of England, Scotland, and Wales and created the "Kingdom of Great Britain", a term derived from the name used to describe the entire island. In 1801, the Kingdom of Great Britain was merged with the Kingdom of Ireland to form the "United Kingdom of Great Britain and Ireland". From 1919-1921, the Irish War of Independence was fought. Finally, in December 1922, 26 of Ireland's counties exited from the United Kingdom of Great Britain and Ireland and formed the independent "Irish Free State". Six counties, called Northern Ireland, remained in the United Kingdom, which was renamed the "United Kingdom of Great Britain and Northern Ireland" in 1927. 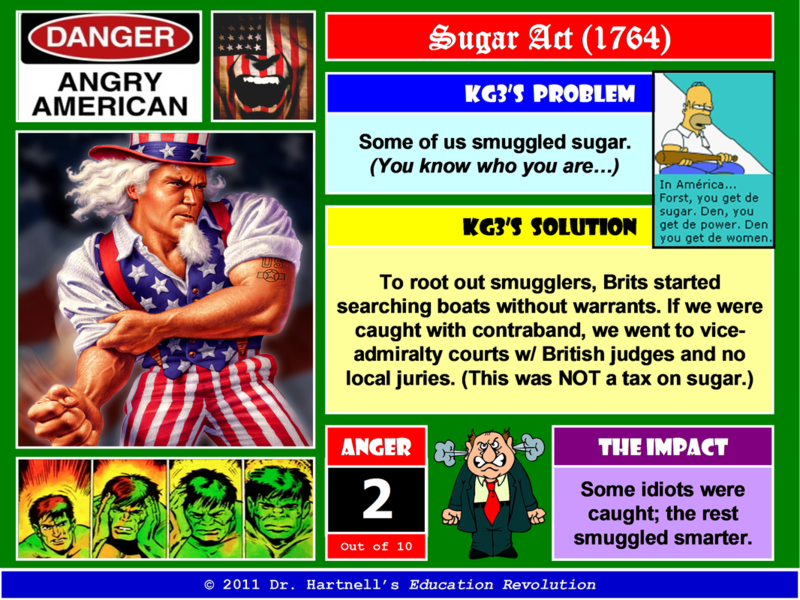 For simplicity's sake, however, throughout the remainder of this unit, Dr. Hartnell will use the term "British" to refer to the Kingdom of Great Britain and use the term "England" or "English" when referencing the time period prior to the merger in 1707. During England's absence – HA! I mean Britain's absence (just seeing if you're paying attention), France built a slew of settlements from Québec to New Orleans and made trading agreements with Native Americans. The French trading empire impeded the expansion of British settlements, and the strength of the French and their Native American allies was a constant concern. 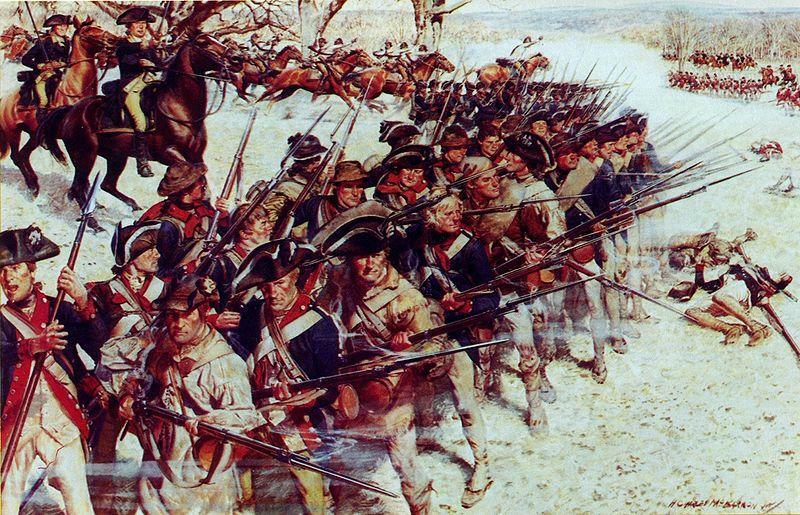 As a result, the British and French fought frequently: in King William's War (1689-1697), in Queen Anne's War (1702-1713), in King George's War (1744-1748), and in the French and Indian War (1754-1763). 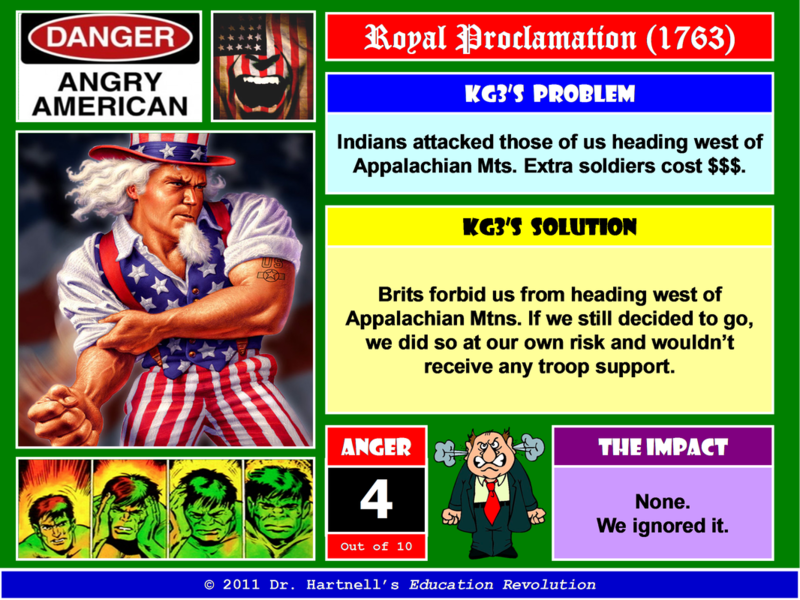 In all of these wars, the French had the assistance of most of the Native American tribes while Britain played the "Mom Card" and guilted America into fighting for her. But Britain wasn't about to lose to the French, so they threw every resource into these conflicts... proving that in order to fix a problem, sometimes you do have to throw money at it. Of course, when you run out of money and have to start raiding your kid's piggy bank, that's when the whole "trust" issue has a tendency to crumble. 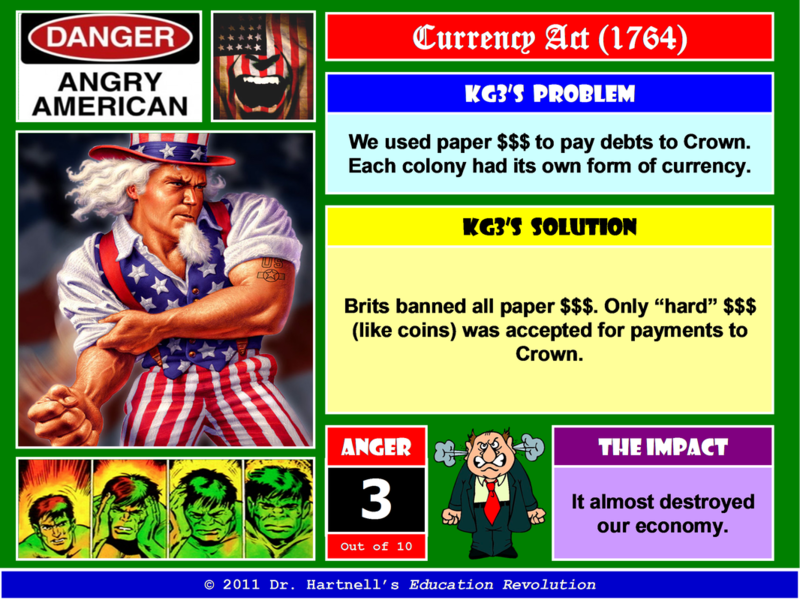 The interest alone on Britain's debt required half of the government's revenues... the overtaxed people in Britain could not be asked to pay any more... the American colonists, essentially, just doubled their playground with all the new land they got with France gone... soooooo, Mom busted out the "As long as you live under my roof" card and asked her kids to pay for the war. As such, from the end of the French and Indian War until shots were fired in Lexington in 1775, relations between Britain and the colonies slowly degenerating into a glorified peeing contest. Both sides were to blame, really. 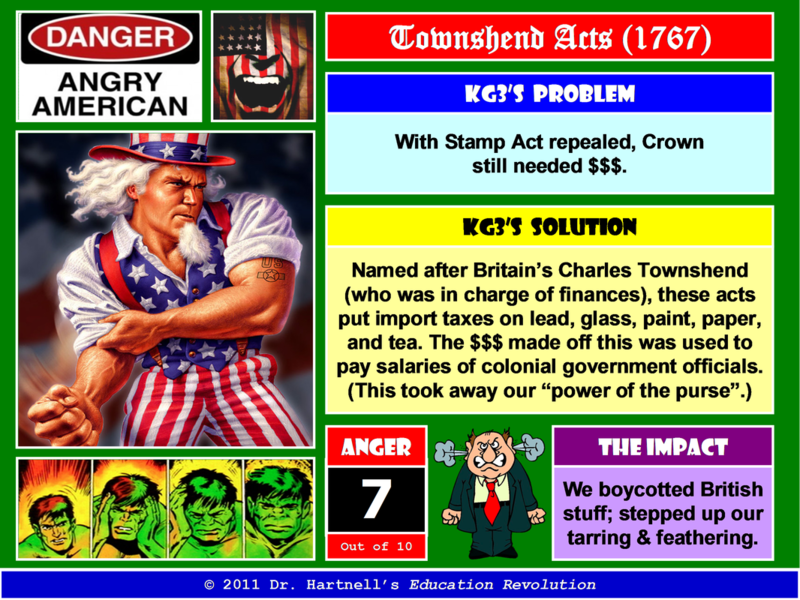 Britain would pass a ridiculous tax knowing full well it would fire up the colonists. Like a disobedient child holding his breath in the checkout line of the grocery store, the colonists would form committees, get drunk, and make awful decisions. 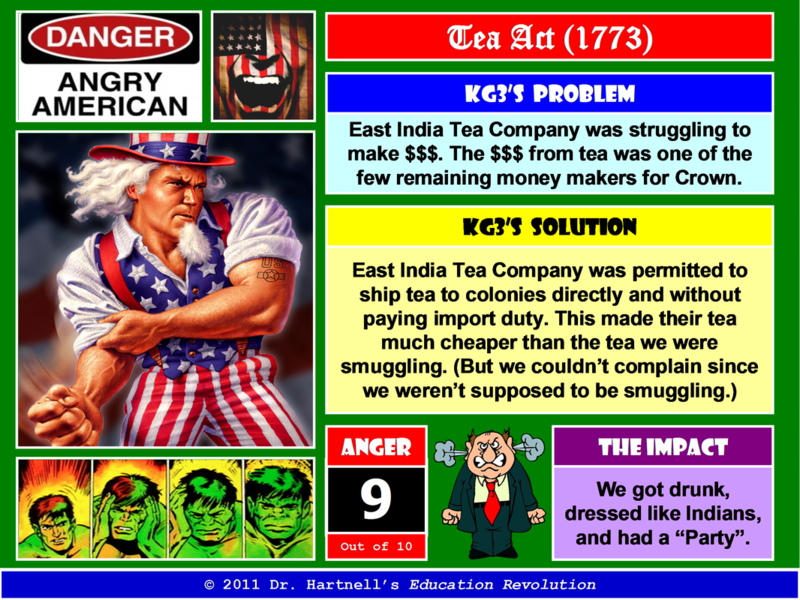 (Seriously, America? Explain to me how chucking snowballs at armed soldiers and daring them to "fire" could possibly end well? 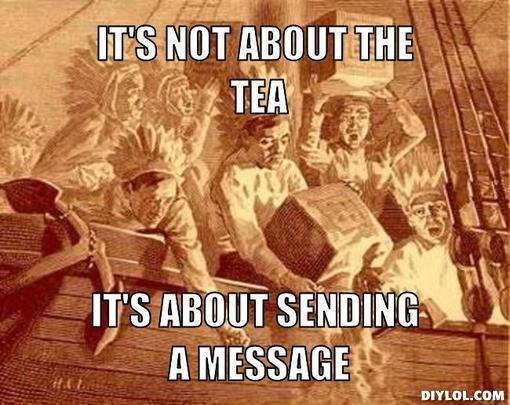 And what part of dressing up like Indians and throwing tea off ships did you think was a good idea? Nothing like destroying $2.2 million of your Mom's personal property to prove a point... and then acting shocked when she flips out.) As it were, Americans weren't so mad at the amount Britain was taxing (one-tenth of one penny was the cost of a stamp under the Stamp Act) as they were mad at the fact Britain thought they had the right to tax the colonies. 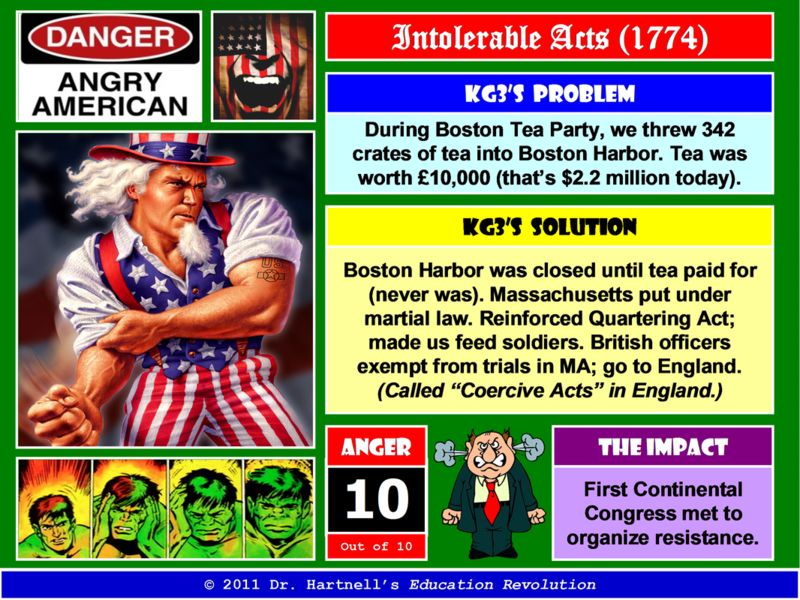 The following are the 10 biggest acts passed by Britain that made America angry. Bad move. 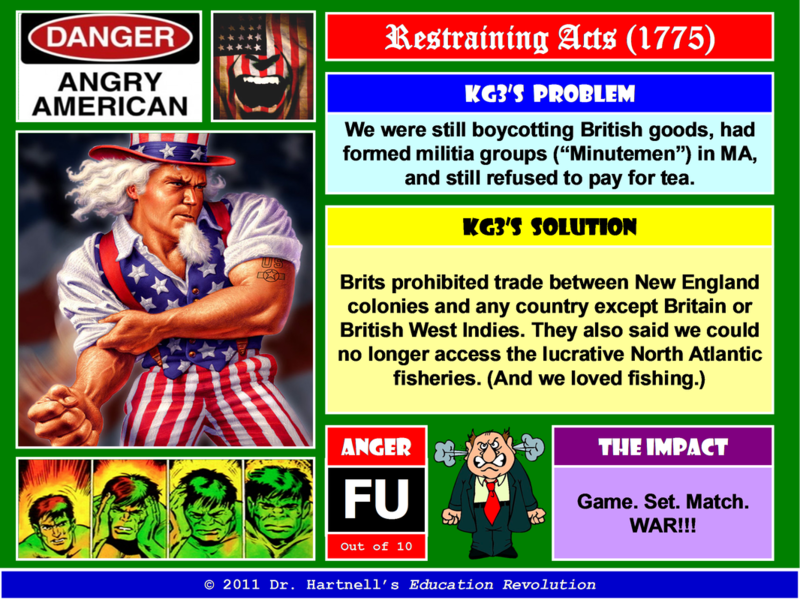 Britain found out the hard way what happens when it makes Americans angry. While the farmers didn't turn into freakish green monsters with superhuman strength (although that would make for a pretty sweet story), they did unleash absolute hell on the British, who had surmised that this little "rebellion" would be crushed in less than six months (and that's including travel time). But Dr. Hartnell is going to let the folks at SportsCenter take it from here! 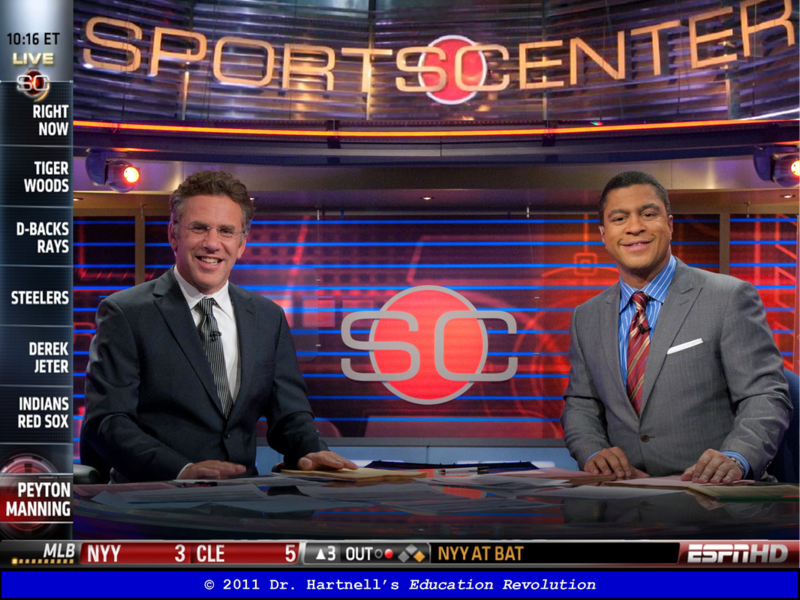 Click here or click the picture below to see a SportsCenter "special presentation" on the American Revolution! What happens when the greatest show on Earth meets the greatest revolution ever fought? Click the picture to find out! An "underdog" is a person, group, team, politician, etc. that is expected to lose. 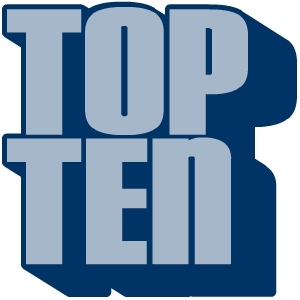 On the flipside, the counterpart that's expected to win is known as the "top-dog". 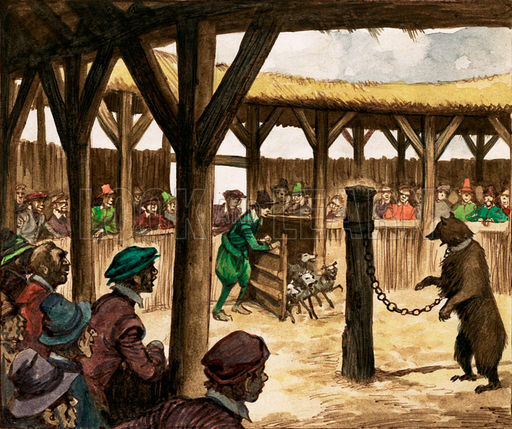 The use of these terms comes from the barbaric blood-sport of bear-baiting where bears would battle hunting dogs in an arena. (King Henry VIII and Queen Elizabeth I were huge fans of the sport.) The "top-dog" was trained to attack the bear's throat and head while the "underdog" was trained to attack the bear's underside. The top-dog had a better chance of surviving and beating the bear... whereas the underdog was more likely to die. mistakenly been attributed to the surprise defeat of the horse Man o' War by a horse named Upset, giving Man o' War the first loss in his career (20-1). While this makes for a good story, the word "upset" had been in use for several decades before Man o' War's defeat in 1919. In fact, the word was first used in 1877. Upset #10: The Battle of Dien Bien Phu (1954). This battle saw the French overwhelmed by Viet Minh forces and ended the First Indochina War (1946-1954) in French defeat. While the Viet Minh had a massive numerical advantage over the French (63,000 to 10,800), and despite suffering 23,000 casualties, it should have never come to this in the first place. France had the upper hand in terms of military power and technology but fell prey to guerilla warfare and outmaneuvering. 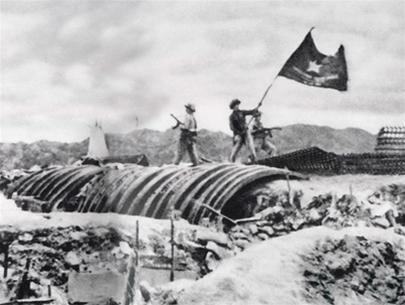 The defeat paved the way for American involvement in the Second Indochina War (1955-1975), better known in the U.S. as the Vietnam War (1964-1973). 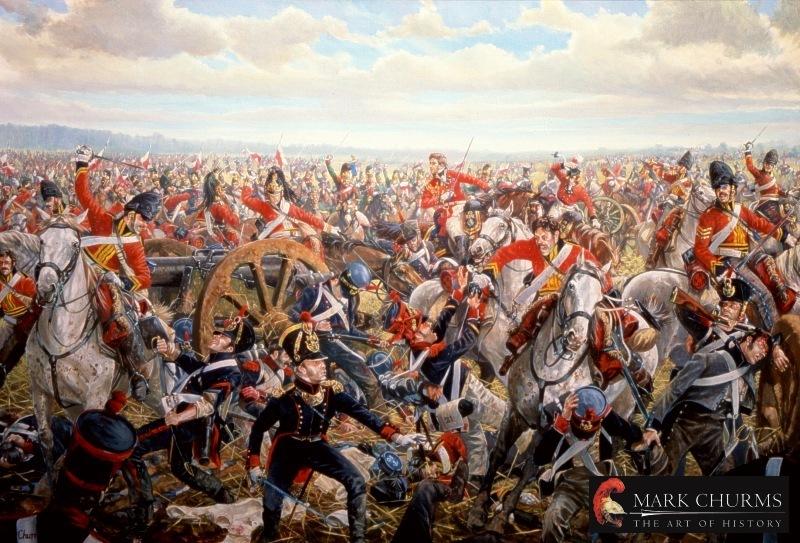 Upset #9: The Battle of Waterloo (1815). French Emperor Napoleon Bonaparte returned from exile in 1815. His return resulted in the formation of a coalition of countries (namely Britain and Prussia) that met, and defeated him, in Waterloo, Belgium. So complete was Napoleon's defeat that the phrase "met their Waterloo" means unexpectedly losing something you were certain you would win. Napoleon's defeat ended his 100-day return from exile, and he was exiled again... this time for good. 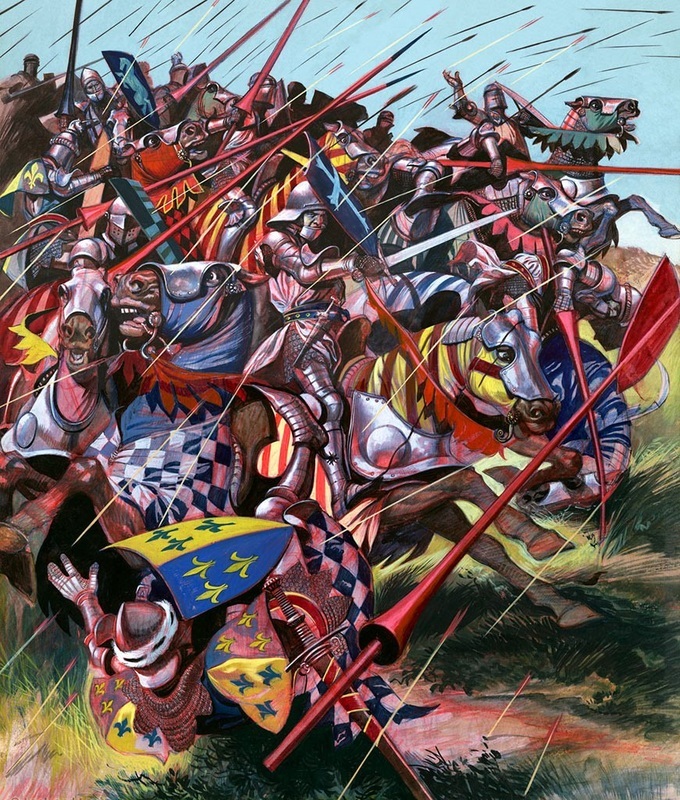 Upset #8: The Battle of Agincourt (1415). Despite massive victories at the Battles of Crécy and Poitiers, the English longbowmen were still heavy underdogs against the French knights during the Hundred Years' War (1337-1453). This was due to the sheer numbers the English were up against (some accounts put it at 6,000 longbowmen vs. 36,000 knights). Whatever the case, the longbowmen mowed down their enemies (literally), killing 9,000 knights while suffering only 400 KIA themselves. (Other historians say the English KIA was as low as 112 to France's 10,000.) 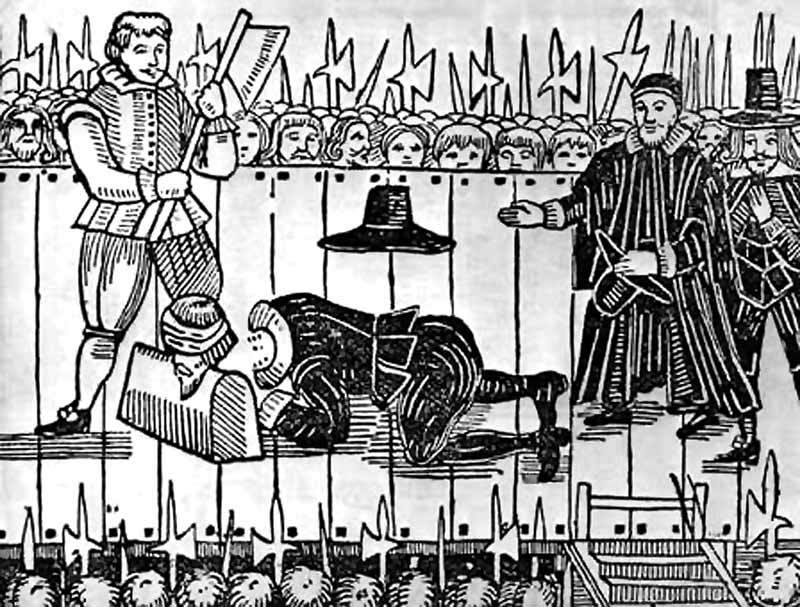 The battle ushered in a new era of warfare, showing that the knights' "old school" ways of fighting were over. 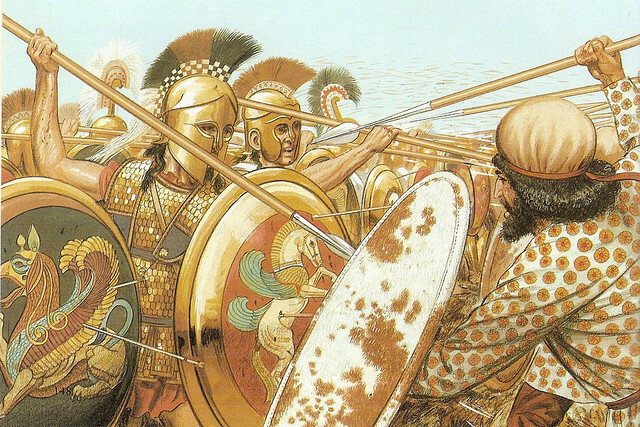 Upset #7: The Battle of Marathon (490 BC). invasion (with epic battles at Thermopylae, Salamis, and Plataea), Marathon marked the beginning of the end of the once mighty Persian Empire. 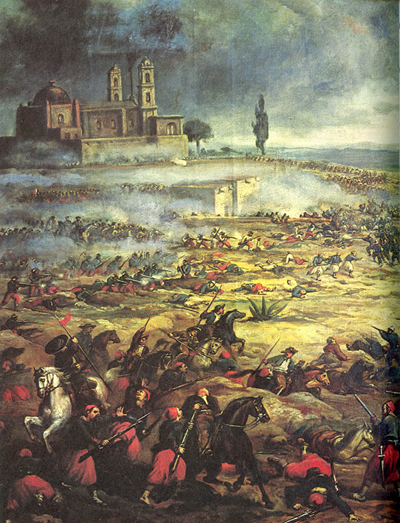 Upset #6: The Battle of Puebla (1862). Who doesn't love Cinco de Mayo?! Well, here's why it's even celebrated in the first place... the smaller armies of Mexico held off an invasion of French forces during a war that France wound up winning. Yes, Mexico celebrates winning a battle in a war it eventually lost! Bueno! (And NO, it's NOT Mexico's Independence Day, so scold whatever Spanish teacher told you that...) Still, the French occupation of Mexico - and their subsequent withdrawal - screwed up whatever political stability Mexico actually had, forever condemning our friends "south of the border" to perpetual chaos and turmoil. Thanks, France! 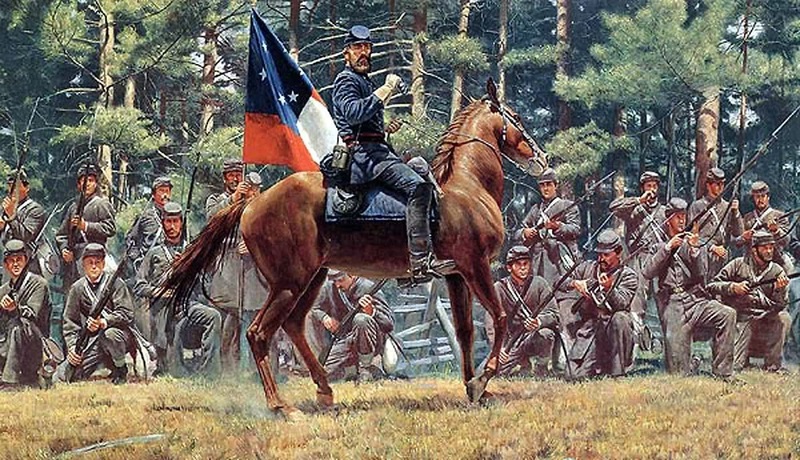 Upset #5: The First Battle of Bull Run (1861). Upset #4: The Battle of Yorktown (1861). 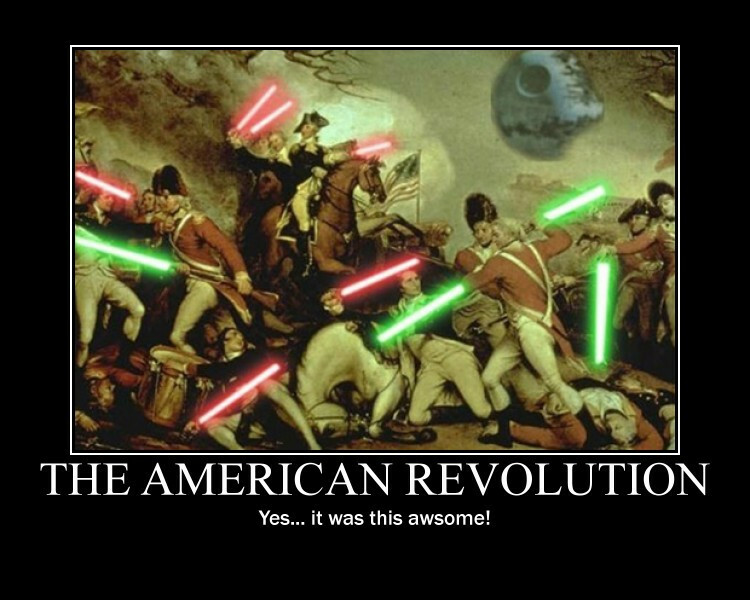 the American Revolution (1775-1783). Talk about a bad time to lose... for him. Not us. We were juuuust fine with him losing. Not too shabby for a bunch of farmers! 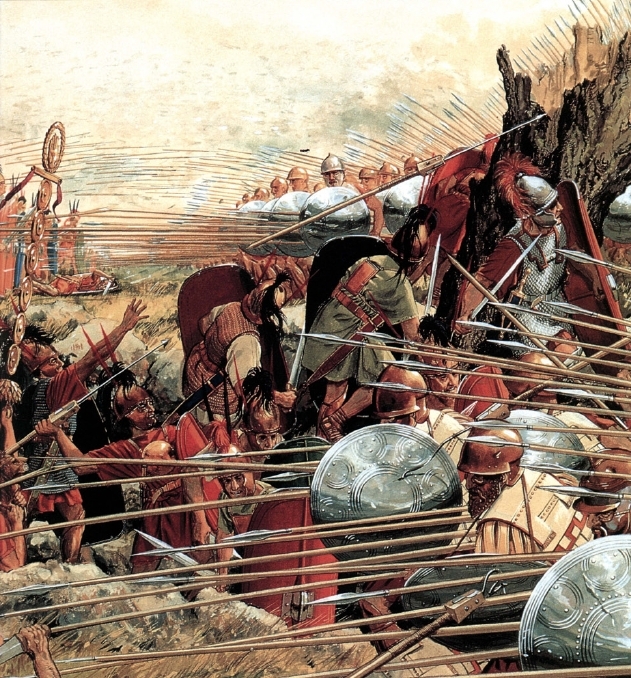 Upset #3: Battle of Cannae (216 BC). 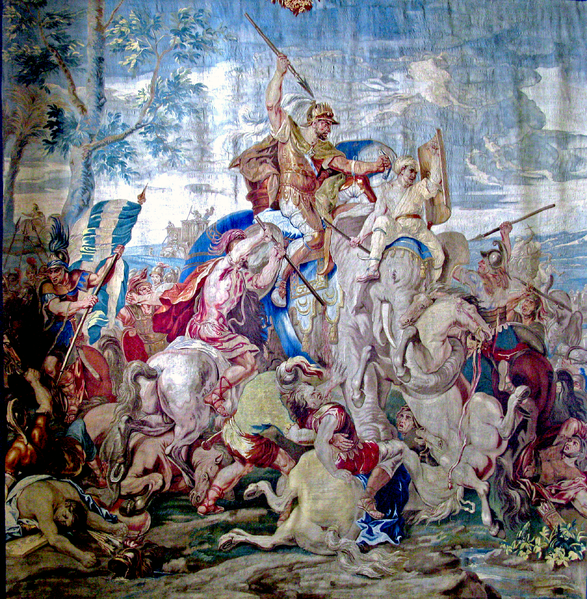 Upset #2: Battle of Gaugamela (331 BC). and gave David time to behead him before he could get up. 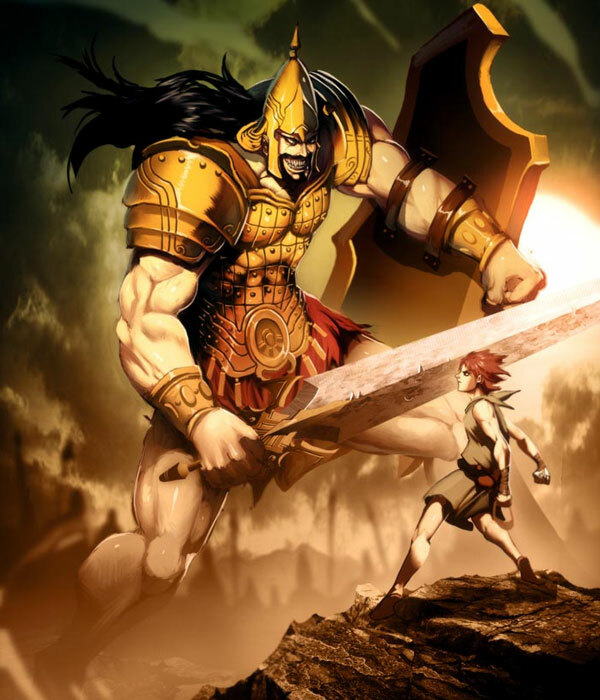 Historians also debate Goliath's "giant" height, placing him somewhere between 6'9" and 9'9". 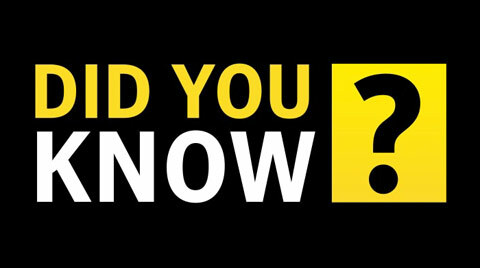 Now, 6'9" was tall for a time period when the average male height was 5'3". Of course, 9'9" is Yao Ming. And that's just stupid tall. Still, whatever his height, David dropped him faster than Dr. Hartnell dropped 3rd period French class. And from this victory came the generic (and over-used) sports analogy of "a David beating a Goliath". You're welcome... every tiny school that's overcome the impossible, defied the odds, never-said-never, dug-down-deep, dared to dream, and killed a giant. 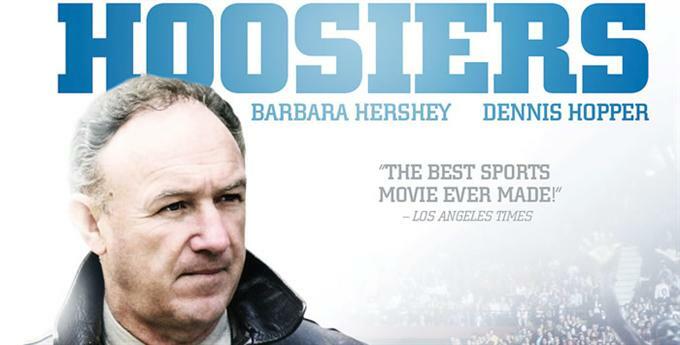 The movie "Hoosiers" came out in 1986 and is about a small-town Indiana high school basketball team (named Hickory) that wins the state championship in 1952. 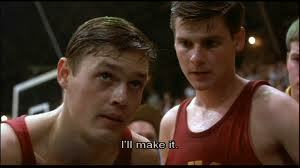 It is loosely based on the Milan High School team that won Indiana's 1954 state championship. 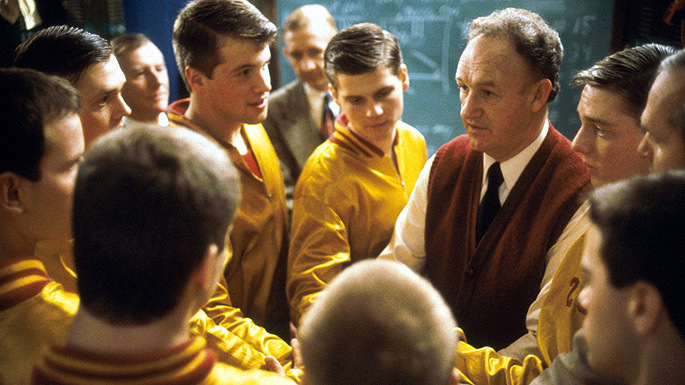 As Dr. Hartnell's favorite sports movie of all time, it should be viewed by anyone who ever wants to play or coach the greatest sport ever made. In fact, watch it twice. In a row.